The Spruce Falls is a large and comfortable family tent with a practical, vis à vis layout that makes it an ideal choice for groups of friends or families with older children that want more privacy. Offering comfortable accommodation for four campers, the Spruce Falls 4 pairs a bright and spacious living area with two large BlackOut Bedrooms. A revolutionary technology, BlackOut Bedroom blocks out up to 99% of light, offering a dark and more temperate place to sleep so you won’t wake with the first light. Easy to pitch, the Spruce Falls 4 has a stable construction that will be stable in poor weather conditions. The tent features strong yet light, fibreglass poles and a high-performance flysheet with a 4500mm hydrostatic head rating. 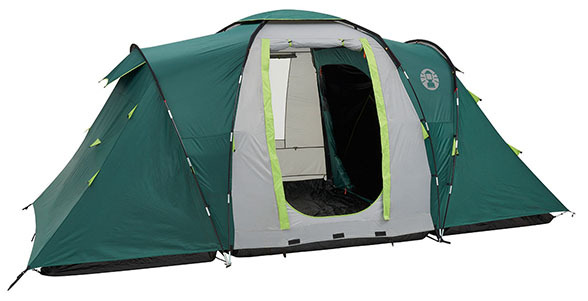 Ventilation openings and double layer mesh doors allow good airflow through the tent and the riser PE groundsheet in the living area and fully integrated bedroom groundsheets ensures clean, dry and bug-free camping. Multiple pockets offer practical storage and the tent features reflective guylines to reduce the risk of tripping. The flysheet is treated with protective UVGuard™ technology and all fabrics are fire retardant for peace of mind.